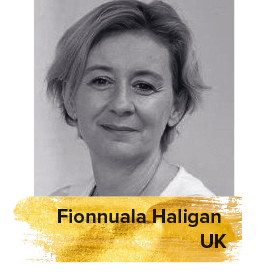 London-based Fionnuala Halligan is the Chief Film Critic and Reviews Editor for Screen International and its daily website Screendaily.com that covers the global film business. She also compiles Screen International’s influential “Stars of Tomorrow” talent issue that spotlights the next generation of UK and Irish actors, directors, writers and producers. Her other roles have included acting as Entertainment Editor and Film Critic for South China Morning Post in Hong Kong for 8 years and as a Consultant at Fortissimo Films. She has written and two books about cinema: Movie Storyboards: The Art of Visualising Cinema (Chronicle Books) and FilmCraft: Production Design (Focal Press).